This unusual surname is of Anglo-Saxon origin, and is an interesting example of that sizeable group of early European surnames that were gradually created from the habitual use of nicknames. These nicknames were given with reference to a variety of personal characteristics, such as physical attributes or peculiarities, mental and moral characteristics, and supposed resemblance to an animal's or bird's appearance or disposition. The derivation in this instance is from the Olde English pre 7th Century "hafoc", Middle English "hau(l)k, haueke", hawk, with "e(a)ge", eye; and presumably denoted someone with particularly keen sight. In 1216, one William Hauekeseye was recorded in the Chartulary of the Monastery of St. John the Baptist, Colchester, Essex. 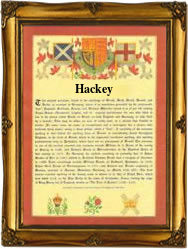 In the modern idiom the surname has a number of spelling variations ranging from Hakey, Hawkey and Hackey to Haukey, Heakey and Hockey. On August 27th 1542 Thomas Hockey, an infant, was christened at St. Stephan's, Coleman Street, London, and on January 20th 1554, Johan(na) Hockey and Roger Fynche were married in that church also. The first recorded spelling of the family name is shown to be that of William Hauekesega, which was dated 1191, in the "Pipe Rolls of Northamptonshire", during the reign of King Richard 1, known as "Richard the Lionheart", 1189 - 1199. Surnames became necessary when governments introduced personal taxation. In England this was known as Poll Tax. Throughout the centuries, surnames in every country have continued to "develop" often leading to astonishing variants of the original spelling.